Mobile decentralized cryptocurrency wallet, SafeWallet, today announced the release of a major update, featuring a first-of-its-kind security system that completely replaces the cumbersome mnemonic phrase/private key backup model of traditional cryptocurrency wallets, and greatly reduces the technical barriers for users. SafeWallet has also announced that it has opened up its security platform to third-party cooperation with other developers in order to provide better wallet security technology solutions to blockchain communities. As a decentralized light wallet that supports multiple cryptocurrencies, SafeWallet is committed to providing users with the most cutting-edge security solutions on the market. Upon its initial release earlier this year, SafeWallet introduced an innovative three-tier security system that solved the fundamental security issues facing decentralized blockchain wallet apps. SafeWallet's innovative security system was even recognized as a model crypto-asset management system mechanism by China's Ministry of Industry and Information Technology (MIIT) in its 2018 China Blockchain Whitepaper. Until now, cryptocurrency wallet users have been forced to use long private keys and mnemonic phrases to back up their crypto-assets, with most wallet apps asking users to copy their private keys and mnemonic phrases onto a piece of paper, which can easily be lost, stolen or damaged. Following the latest update, SafeWallet users can now recover their crypto-asset wallets using a simple two-layered security system consisting of a QR code-based user ID and a series of security questions. Once set up, users can easily recover their crypto-assets by simply scanning a personalized QR code image and answering a set of predetermined security questions. "There is no longer any need to memorize or transcribe long mnemonic phrases or private keys," said Kaiser Zhang, Product Head of SafeWallet. "This complicated backup process has been one of the primary barriers for users of cryptocurrency wallets, and especially for those who are new to the industry. With this latest update, we are proud to say that we have finally solved this usability issue without sacrificing any of the security capabilities that SafeWallet is known for." SafeWallet's innovative new backup system greatly increases ease-of-use while solving issues related to forgotten mnemonic phrases and paper backups. The system also protects against malicious software, which can steal assets through operating system vulnerabilities or when they are being transmitted through unsecure channels such as instant messaging and email. In summary, the new security measures greatly simplify the complex operations of traditional blockchain wallets, while providing the optimal balance between ease-of-use and security. 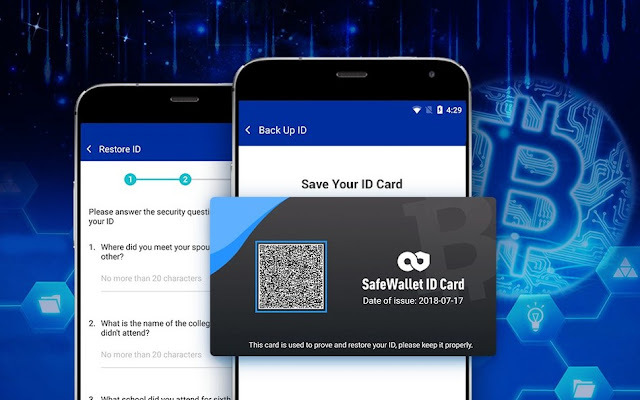 SafeWallet's user IDs are encrypted using the most advanced QR code encryption technology, including threshold cryptography, HASH function mechanisms and image fault-tolerant mechanisms, thereby guaranteeing the safety of users' crypto-assets. SafeWallet has also opened up its fundamental security technologies to third-party developers in an effort to bring better crypto-asset wallet security to blockchain communities. With this announcement, SafeWallet's innovative ID system will serve as a bridge connecting decentralized and centralized systems and resolving ease-of-use and security issues for blockchain products.